The da Vinci miniMaker is the perfect desktop 3D printer for beginners. Its lightweight and compact design fits easily in tight places, and it boasts a 5.9 x 5.9 x 5.9 inch print bed. 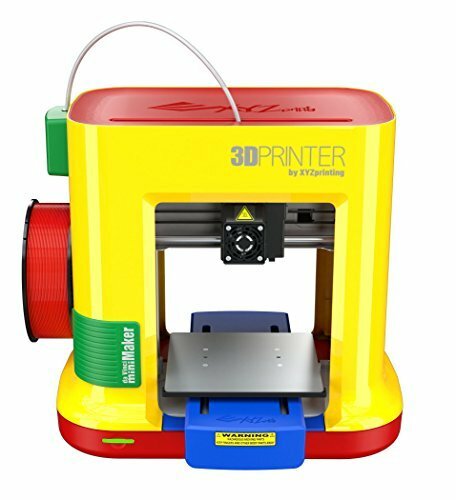 It has an auto-leveling bed and auto-calibrating extruder module ensures the best possible prints. The miniMaker only prints in DEHP-free and Heavy metal-free PLA filament, ensuring that prints are safe for children and family. Print Speed Upgrade: Max print speed up to 100mm/second. (XYZware software must be version V2.1.12.1 or above) Innovative Auto-Calibration: This 3D printer utilizes a new 9-point calibration detection that adjusts the print bed level along the Z-axis. Just run the calibration test and watch the printer adjust itself! Compact & Safe: Though compact with just 18lbs, this 3D printer offers a 5.9 x 5.9 x 5.9 inches build volume. The da Vinci miniMaker 3D printer uses non-toxic PLA filament and has a non-heated print bed for child safety Free XYZ 3D Resources: XYZmaker 3D Design Software, XYZ 3D Gallery, XYZprinting STEAM 3D Printing Education Curriculum, XYZware 3D Printing Software Warranty & Support: Within 30 days of printer registration on XYZprinting official website, users will receive 1 year limited warranty & 1 year unlimited phone/ mail support.